Yeah really great considering there’s only been one video, a week of advertising and one full day of promo! Plus concerts are 6 months away - still time to keep selling. Means they can invest the money in the show I hope! I am only coming to this tour if they add May 21st (my birthday), or 20-22, which are close enough. 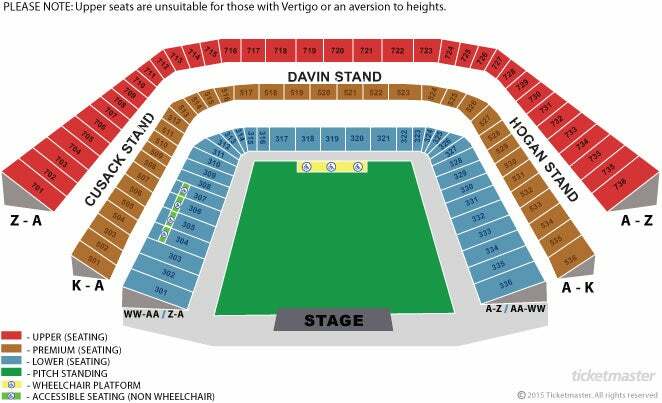 Cardiff - interestingly the blue tiers are unreserved seats. You're not allocated specific seats, you just sit where you can! So with this ticket you could actually choose to stand in the general standing area or find a seat. I assume they wouldn't be particularly good seats though? Hmm they look pretty decent to me on Google. It has a rake, so you won't be at the same level as the pitch. However the rake is smaller than the upper tiers. I wonder which blocks in Tier 1 the unreserved seats would be in? It's just that there's also the £136 / £93.50 / £77.00 reserved seats on sale as well, and I guess that these higher priced reserved seats would be in better blocks/rows than the £77 unreserved seats? Haha, concert ticket buying is such a headache! This looks like such a good representation of what the Spice stage will be! Thanks for posting! Tickets on sale next Thurs at 9am! Demand seems a little bit slower this time. I just logged on and could get spice circle. I reckon they are starting to exhaust current demand (outside of London - reckon they could sell another Wembley date). Course a bit more promo will spur sales on - need to maintain momentum a bit. Cardiff seems to be a much slower burner than the previous dates, but there wasn't as much of an "event" around it as the original on-sale. It's probably better to have a few tickets left to shift, than not to meet demand and have them on the scalper websites. Plenty of events coming up too - X Factor/Strictly (maybe a bit late in the day now), but Red Nose Day and BGT could also be viable promo slots. I hope they tie in their next promo batch with ‘something’ physical to promote. Most fans will have already got your tickets - might as well flog the tour to the general public and something else to the fans! I think tickets to any further U.K./Ireland and EU-dates will sell much slower than the U.K. dates originally announced. Their manager said 2020 for a possible extension of the tour, I think they would be better off to release these tickets just ahead of the U.K./Irish tour starts off, there will surely be a lot of attention on them, they could ride that wave if they decide to announce a US and AU extension of the tour. Still Spice Circles left for this one. Good thing its not the opening night any longer! lol! I love the stuff we have to play with now. So this is not a UK tour anymore, now that they've included an Ireland concert.